If you've seen a lot of my posts on 12WOCT in the past couple of years, you will have noticed that a lot of the traditional Goan Christmas sweets are very time consuming and labor intensive. Needless to say, the end results are absolutely delicious. But sometimes, you just don't have the time or there's too much on your plate and you still want to put together a fabulous home made Christmas platter without having to fuss about to much. Is that even possible?, you might wonder. Well I'm happy to tell you that it most certainly is. 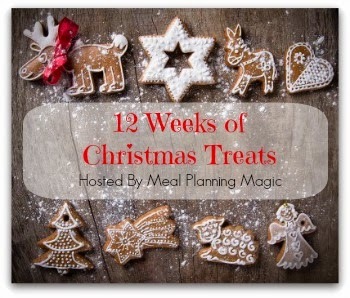 For this years edition, my focus has been on treats that are quick and easy to make and taste delicious. So whether you are a novice in the kitchen or are simply short on time but still ant to impress, you've come to the right place. For this weeks reveal, I've put together these yummy pretzel treats. They are so versatile and can be dressed up for pretty much any occasion. Simply switch up the sprinkles or use some colored sugar and you have something fancy you can put together for Halloween, Christmas, Easter or even color co-ordinate them for showers or birthday parties, the options are endless. I'm not too happy with the evenness of the chocolate coating on some of them, but I think they still turned out alright. The next time I make these, I'll either double dip them in the chocolate or I'll cool the chocolate down a little to thicken it up a bit. I'm also very eager to try candy melts the next time around. I used mini pretzels and I think they're just way cuter since they're smaller. But these turned out really well. While I was dipping these in chocolate, my husband decided to help out by supposedly "tasting" some even before the chocolate had an opportunity to set up. In my experience that's good news. He has really good taste. He isn't fussy about food and will silently endure all the torture I put him through while I'm experimenting with new ideas. But when he really enjoys a dish, I can tell, and it makes it all worthwhile. Let me tell you this much, its hard to stop at one, or two, or even three with these bite sized treats. Break the chocolate bar into smaller pieces and place in a microwave safe bowl and microwave on high for about 30 seconds. Stir and continue heating in bursts of 30 seconds till it melts and stir in between each zap, to ensure the chocolate doesn't burn. Prep a little assemble line of sorts on your table / counter / work platform. 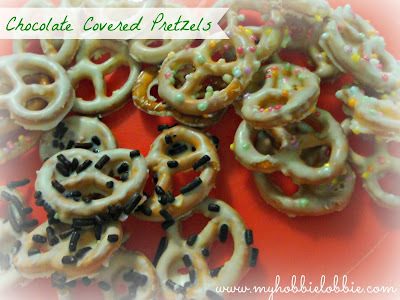 I placed them in this order - pretzels, melted chocolate, plate lined with baking parchment, sprinkles. Dip the pretzels in the chocolate, and using a fork, pick it up and place it on the lined plate. Sprinkle the 'sprinkles' over it as desired. Leave it to set. I usually pop it in the fridge for about 20 minutes. There you go. That how quick, simple and easy this is. Repeat the process till you're done. You can also use milk or dark chocolate if you prefer. Don't forget to check what the others have put together this week. We will be posting one new recipe every week for 8 more weeks so don't forget to stop by every Wednesday for a new idea. If you'd like to join in and cook / bake with us, you can sign up at Brenda, our hosts blog, Meal Planning Magic.